Bred by E.P. Taylor. Owned by Hickory Tree Stable. Reviewing the events of 1983, Kent Hollingsworth, respected editor of The Blood-Horse magazine wrote, “Easiest winner of the year… Devil’s Bag!” Hollingsworth added that not only had the extraordinary 2-year-old repeatedly dominated his divisions, he set stakes records, won by large margins, and seemed to do it with considerable ease. Bred in Maryland by E.P. Taylor, Devil’s Bag was a son of Leading Sire Halo out of Broodmare-of- the-Year Ballade. He had been purchased as a yearling for $325,000 at the Keeneland July sale by Mr. and Mrs. James Mills’ Hickory Tree Stable. Conditioned by Hall-of-Fame trainer Woody Stephens, Devil’s Bag won five starts at two by a combined margin of 27 lengths. He set stakes records in Belmont’s Champagne S.-G1 and Cowdin S.-G2, and drew off by 5 1⁄4 lengths in the Laurel Futurity-G1 at odds of 1-to-20. Widely regarded as the best juvenile America had seen since Secretariat, Devil’s Bag was an obvious choice as Eclipse Champion 2-year-old colt. Devil’s Bag made his three-year-old debut in the Flamingo Prep Stakes in February, winning by seven lengths in a blistering 1:21 3/5. After a disappointing fourth in the Flamingo S.-G1 (in which he may have sustained a chip fracture to his right knee), Devil’s Bag won Keeneland’s Forerunner Purse by 15 lengths followed by Churchill’s Derby Trial S. While stablemate Swale went on to take the Kentucky Derby-G1 and Belmont S.-G1, Devil’s Bag was retired due to an injury with a record of eight wins in nine starts for earnings of $445,860. Devil’s Bag stood his entire career at Claiborne. 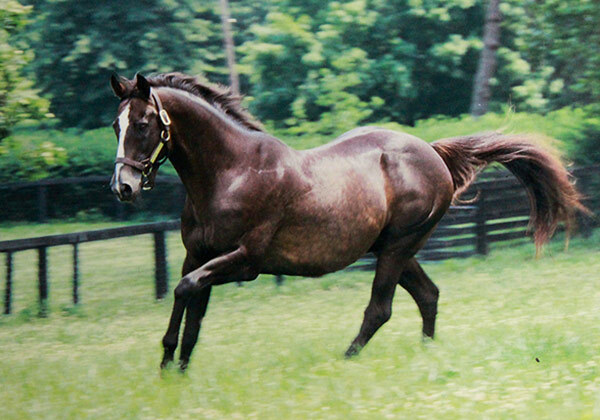 He sired more than 75 stakes horses, half of which were graded, and the earners of more than $50,000,000. Multi-million dollar earner Twilight Agenda, came from his first crop. Other notable runners by Devil’s Bag include: $4.9 million earner Taiki Shuttle, $3.9 million earner Devil His Due, Gazelle-G1 winner Buy the Sport, and 2004 GSW Diplomatic Bag. Further, he is the broodmare sire of 85 stakes winners and seven champions. Devil’s Bag died at 24 on February 3, 2005. He is buried at Claiborne Farm.